Bird brained they might be, but crows are the MacGyvers of the avian world, able to turn twigs and even their own feathers into tools for getting at hard-to-reach food. But while young crows are born with a propensity for crafting tools, it’s only after watching their elders make and use tools that they become truly proficient, a new study suggests. 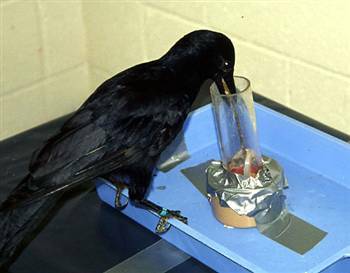 Compared to other crows, those from the Pacific island of New Caledonia, located east of Australia, are master tool makers and users, second only to humans and on level with chimps when it comes to finding novel uses for everyday objects. In their natural forest environment, the midnight-black birds fashion twigs, leaves and even their own feathers into tools for rooting out insects in dead wood.